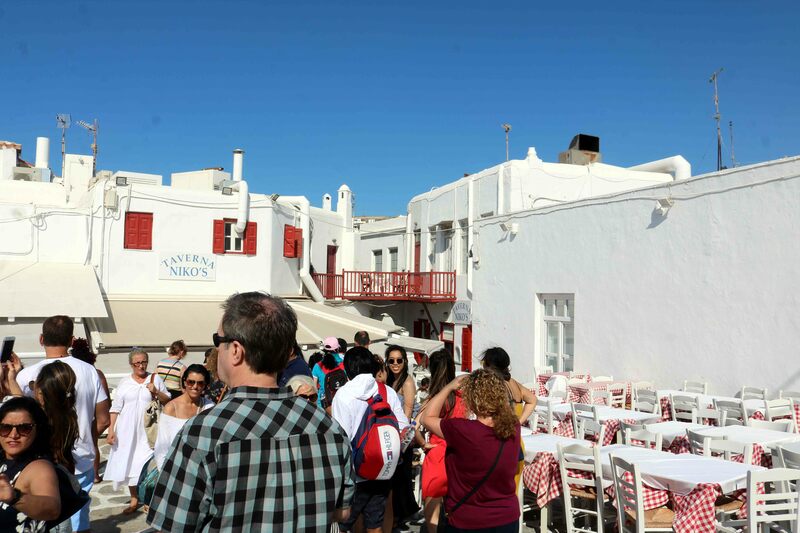 June 12, Tuesday, was spent exploring Mykonos Island. After breakfast, we boarded a bus from Chora to Paradise Beach, a 10 km trip. We walked about a kilometer to reach Paradise Beach. Here we rented a canopy with sun-beds. We enjoyed a swim in the cool, crystal-clear, blue green coastal waters. The setting simply forces you to adopt a laid back attitude and let the rhythm slow down under the warm and bright sunlight. A local Greek cocktail played its part too. The famous Paradise beach is a nice, flat, white-sandy beach of impeccable beauty, dotted with a number of popular bars. It is a getaway, mainly for the young and also for the not so young. It is now Greece’s number one open-air seaside clubbing venue. There is live music playing from all the restaurants. Sun-beds with grass canopy are available on rent. It has to be seen to believe. The place comes alive mainly with the hep crowd, young, wild and rich. Glamorous parties and endless entertainment in the infinite sunshine with a picturesque landscape as a backdrop. After lunch, we returned to Chora. 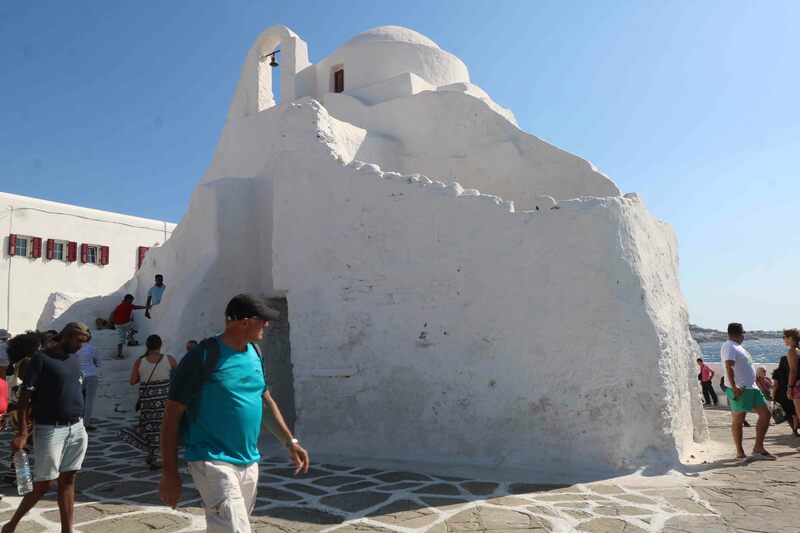 Located on the island’s Western harbour is Chora. It is a very beautiful old town, which in the past was visited by merchant fleets from all over. Today it has become a popular tourist destination. 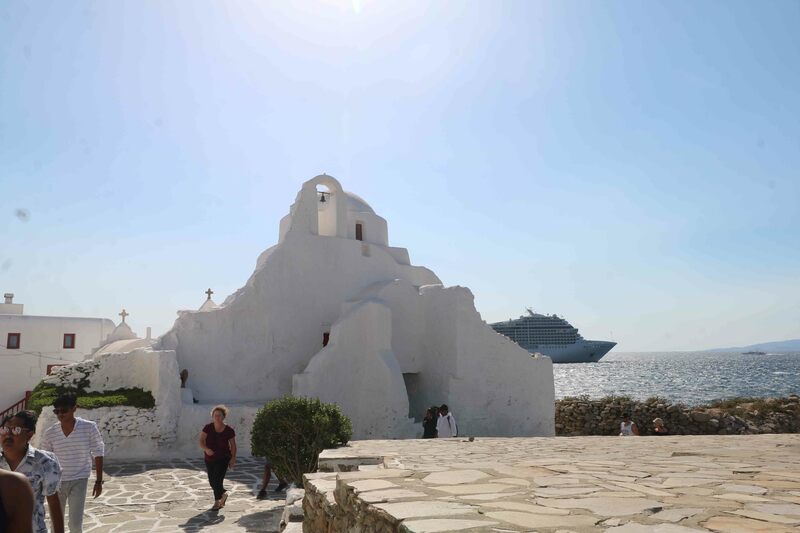 There are whitewashed houses, windmills, a multitude of chapels, busy back streets with balconies full of flowers and multi-coloured fishing boats in the port. It becomes very crowded after sunset as tourists throng this luxurious marketplace, restaurants, bars and discos. We got off from the bus and headed towards the windmills on foot. 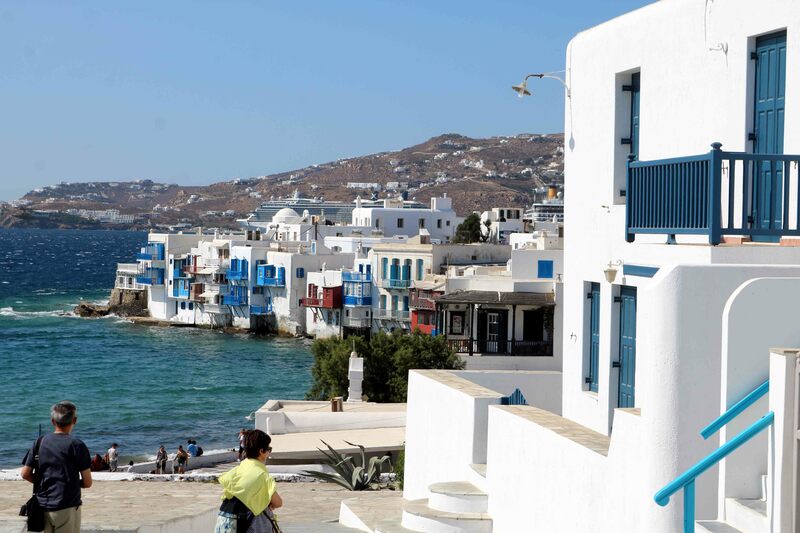 From as early as the 16th century these windmills have been the classic landmarks of Mykonos. 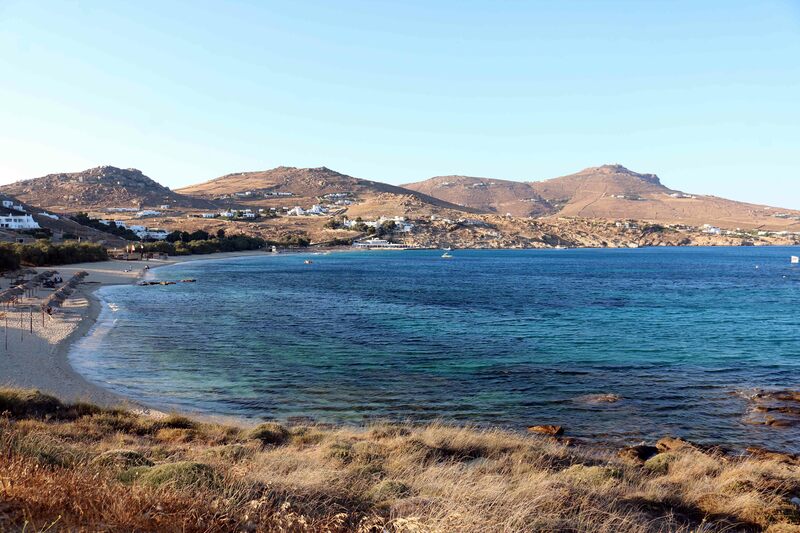 Due to its geographic location, Mykonos being situated on major sea trade-route, traded in grains. The need to grind grain flour and then ship it out to distant lands, must have made Mykonians to set up windmills, as there was plenty of regular wind all the year round. To facilitate easy access to the harbour, these windmills were positioned in or around the main port. 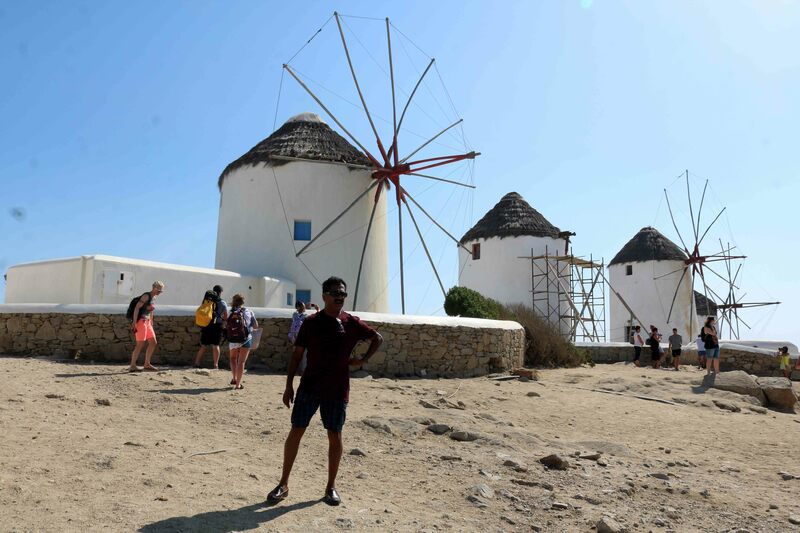 The windmills of Mykonos must have contributed to the economic prosperity of the island in those days. In 1700 AD, about 11 windmills were in operation around the port. With the advent of modern technology, especially after World War I, these windmills ceased their operations as more efficient flour mills were commissioned. Today these well preserved windmills stand as iconic landmarks of a medieval period, sentinels of simplicity to balance the surfeit of all round glamour! Though the Greek islands have been blessed with strong dry winds that blow from the Aegean Sea all through the year, we did not come across any wind turbines in any of the islands we visited. There were no solar panels either to be seen. May be the Greeks did not want to displease Anemoi – the Geek God of wind – and Helios – their Sun God. From the area of the windmills, narrow and endless cobblestone paved alleys lead us to Little Venice. It is a charming little area looking into the sea. Buildings with balconies that overhang the water and the windmills in the background make this area the subject of many paintings and is a photographers dream. 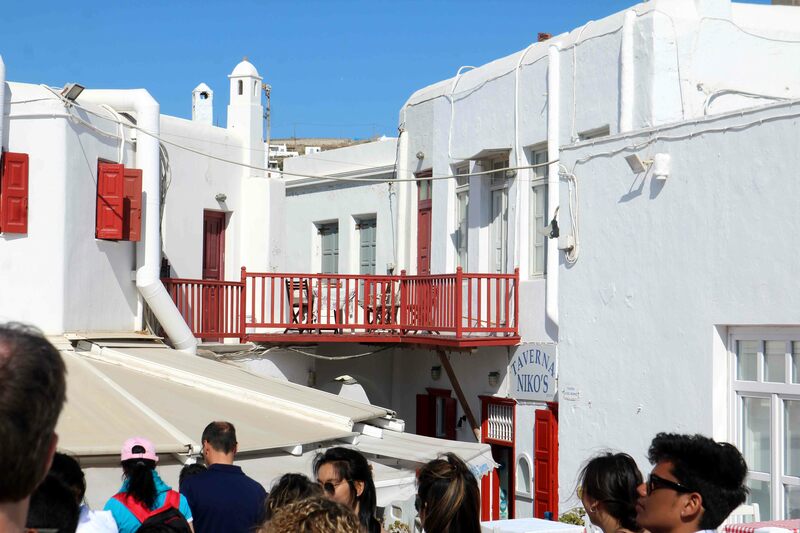 Little Venice is an area that lines the waterfront with rows of Eighteenth century fishing houses with balconies that jut into the sea. These houses originally belonged to shipping merchants which gave them direct access to the sea. Being built right on the water, it resembles Venice of Italy, hence the name ‘Little Venice’. Most of the cafes will start putting out reserved signs on the tables that are right on the edge of the sea as these are the prime tables. 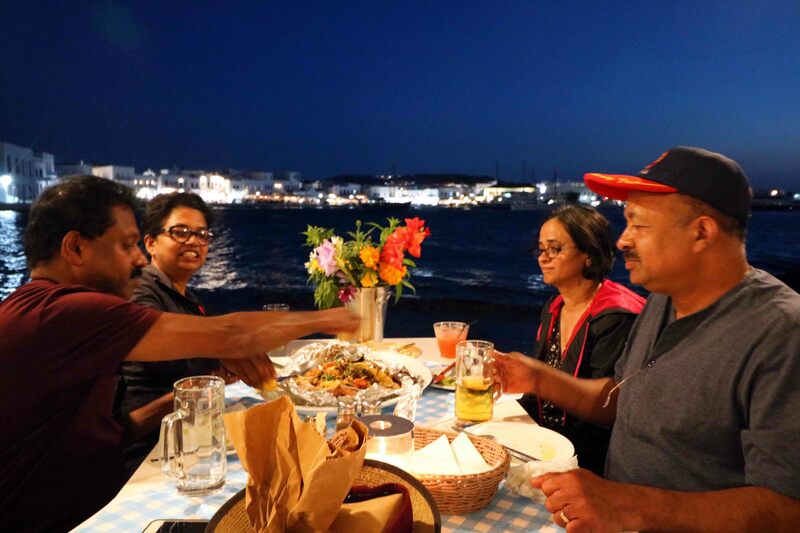 You may not find fine dining here but it is all about the experience of sitting beside the seawaters for a special dinner, a once in a life time experience. Like in Venice, the balconies of houses here are interconnected over the lanes at many places. It is to facilitate the residents to move around in rains without getting their feet and shoes wet and muddy. 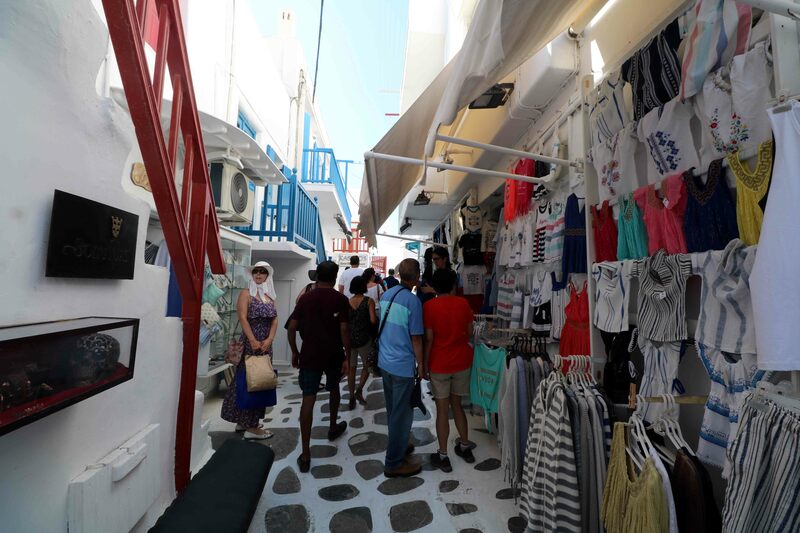 Surrounded by the boutiques and bars in Little Venice stands the flower-bedecked Church of Panagia Paraportiani (Our Lady of the Postern Gate). This church is a cluster of four whitewashed chapels, topped by a further bright white chapel on the upper storey, reached by an external staircase. Built between the Fourteenth and Seventeenth Centuries, the church once guarded the entrance to the town’s castle, long since destroyed. The multi-layered nature of the church gives it a unique shape, rising from the squared-off white chapels on the ground level to the domed church of the Virgin Mary on the top. The church has no windows or doors as seen from the sea. Rather from the seaside, it does not resemble a church. It was constructed this way not to attract attention of attacking pirates. From Chora, we took a bus ride of 10 kilometres to Elia Beach. 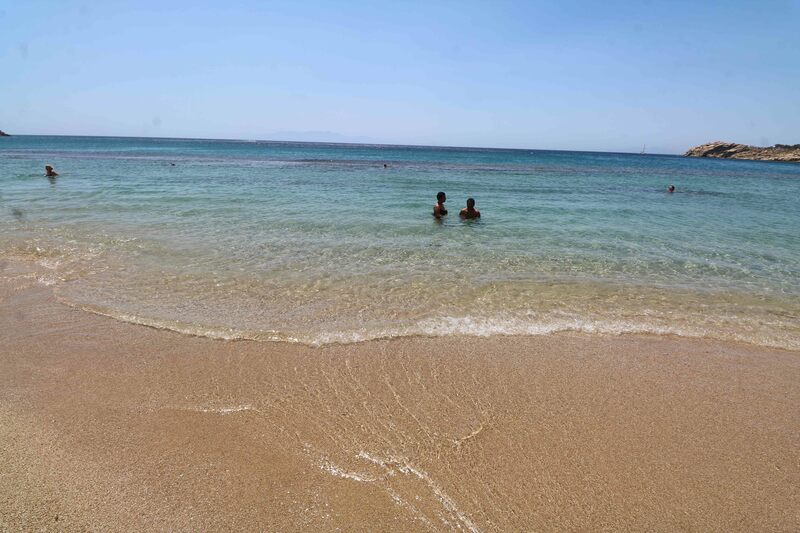 Elia is the longest sandy beach of Mykonos, offering a wide choice of taverns and bars as well as water sports facilities such as water-skiing, parasailing and windsurfing. There are comfortable lounge beds and umbrellas lined along the sand. We enjoyed the views of the Aegean Sea and the nearby island of Naxos on the horizon, obviously with a cocktail in hand. 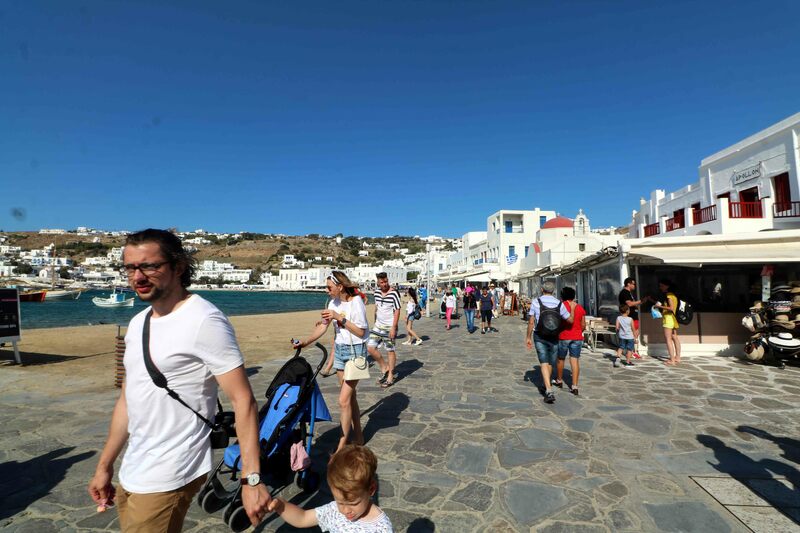 Elia is one of the most popular nudist and gay beaches in Mykonos. We returned to Little Venice in the evening, well before sunset to take up our reserved seats at the restaurant at the brim of the sea. The area was thronging with tourists as everyone comes here in the evening, to watch the magnificent sunset. As the sun goes down, the sky shows off some brilliant colours of red, orange and pink. The reflection on the water is awesome. The expression “picture perfect postcard” some how seemed be so very apt. At sunset, we watched a profusion of colours ever so slowly leak out of the Aegean sky, enjoyed a sumptuous Mediterranean dinner, mainly of seafood and Greek salad and then returned to our hotel, quite exhausted and a lot more contended. Reji man, I feel like I gotta visit Greece soon !! !